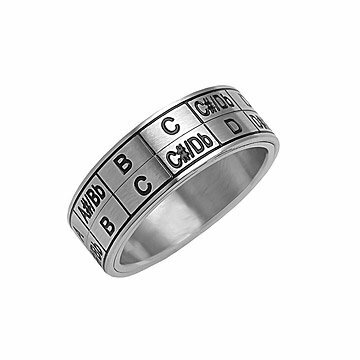 This stainless steel ring displays a basic principle of music theory using an easy-to-understand graphic. When you're just learning music theory, it can be tough to remember how to transpose every key from A to G. Seth Sterling's harmonious marriage of fashion and function eliminates the need to crack open a book or do a web search when you'd like to change your tune. His stainless steel ring displays a basic principle of music theory, the "circle of fifths," using an easy-to-understand, double-decker graphic. Turn to the ring to find the key you need and get back to composing your masterpiece. Made in China. Nice and hefty for the price. Spins smoothly. Very unique ring. My granddaughter will love it. I'm an active musician and this is a perfect addition to my daily jewelry. It's very helpful when I have to read through my music and transposing between different instruments. This was a gift for my niece. It only comes in two sizes so it doesn't fit her. She wears it on a chain around her neck. It helps her greatly with music and also as something to calm her anxiety. This product is a great tool. I am a very visual person, so seeing the notes lined up with each other is very helpful. While it is taking a little to keep my mind wrapped around which way I'm transposing depending on how I turn the ring, so far I think it will be very helpful. I'm looking forward to using it this coming year in my teaching. My mom loved it! The spinners are really smooth, and it looks nice to boot. She's a musician, so it was more than just a nice piece of jewelry; it's something she can actually use. My daughter has begun transposing music and this was a great idea. It seems well constructed and she loves it! The ring is useful for my stepson who's just learning to play music. He surprisingly liked it, but I wish it came in more sizes than just 6 or 10.